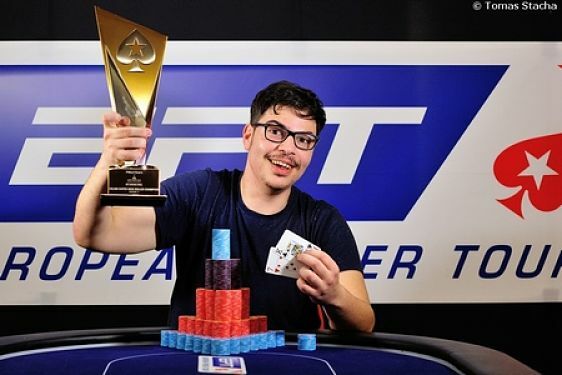 Italy's Mustapha Kanit upset the formbook in the early hours of Monday morning after he took down the EPT Grand Final's €50,000 Super High Roller. Despite sitting down alongside 65 of the biggest names in poker, including Martin Finger, Scott Seiver and Fabian Quoss, the young Kanit was able to keep his cool heading into the final table on Sunday evening. Having already scooped $2,700,000 in career earnings before the event started, including a $492,600 haul for finishing fourth in the 2014 PCA High Roller, Kanit was on the fringes of becoming a major star in the tournament world. However, in order to move out of the shadows and into the spotlight, the Italian needed a special performance during the final session. Fortunately, Kanit's path to the title was made slightly easier when America's Scott Seiver was sent to the rail in ninth place. Unable to parlay his short stack into something meaningful, the seasoned pro pushed open the elimination floodgates and from there the likes of Ivan Luca, Mark Teltscher, Andrei Streltsou and Fabian Quoss followed. With just four players left, Kanit began to take control and, after helping to eliminate Fedor Holz and Martin Finger, the Italian got to work on Canada's Mike Watson. At this point the three hour mark was approaching and as his rail caused a riot on the rail, Kanit was able to hit trips with Kc 7h as the board rolled 7d 7c 6d 3h 10c. Watson was unable to answer the call with Kd 5c and as he departed for the rail, Kanit's rail stormed the stage to celebrate the most prestigious win of their hero's career, as well as a €936,500 payday. Image courtesy of Tomas Stacha @ PokerStars Blog.